Happy Thursday, and welcome to the third What's New With You linkup! Thank you to everyone for joining Kristen and me again, and I can't wait to hear what's going on with everyone since last month. 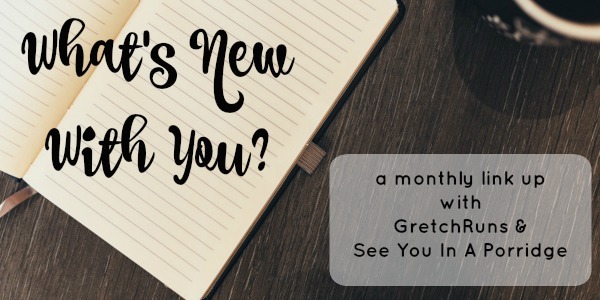 There's a lot going on in my life, so here's what's new with me! We finally closed on our house! After months of searching and three bidding wars, we finally have our first home. We closed on April 1, and I'm already in love. The house is in our ideal neighborhood and on a small cul-de-sac (it was always a dream for both Dan and me to live on a cul-de-sac so this was really meant to be!). Thank you so much to everyone who told me that everything would work out, and I would find the right house eventually. You were all right! We started to move in small things last weekend, and will probably completely move in sometime at the beginning of May. If you follow me on snapchat (gretchxo) you might have seen the tour that I gave yesterday! I also met about half of the neighbors on the street so far and everyone is so nice! I'm starting a new blog! I'm really excited to share all of my house projects and improvements that we make over the next few years, but it doesn't really fit with "GretchRuns". I know that some of you visit just for running, fitness and personal updates, so I thought it would be better to separate these two worlds. 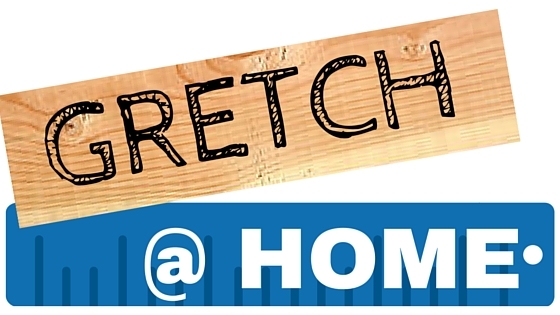 My new home blog will be called "Gretch @ Home", and my first post is live today! I'm still working on quite a few things over there, so bear with me! Nothing over here will change- I'm still going to post 4-5 days a week about fitness and food. I might move the lifestyle posts (makeup, fashion, etc) over to G@H- what do you think? ...and I'm really nervous. The past few weeks have been really stressful and hectic, between closing on the house, visiting Dan's family, dealing with changes at work, moving stuff into the new house, working on my new blog and keeping this one up- running hasn't been the first thing on my mind. Most of the time I get home exhausted and the last thing I want to do is work out! I think I'm still going to run the race, but use this as a learning experience for my goal race. Last year, I did the same thing with the half (ran the Biggest Loser half in June then had a huge PR at the Towpath half in October). In fact, I loved the Towpath Half so much that I decided to run the full marathon this year as my goal race. I loved everything about that race, and I think that will be the perfect opportunity for me to break 4 hours. Now, let's just hope I can finish Gettysburg in one piece! This month's featured blogger is Rachel at A Nesting Nomad! Rachel recently returned from Istanbul and all of her posts are incredible and giving me major wanderlust! Make sure you check out her blog! If you want to be a featured blogger next month, make sure that you link back to both Kristen and me! That is so exciting that you started a second blog! You do such great craftsy things that I am sure it will be a hit. And no doubt you have some projects lined up for the new place. Can't wait to see them! congrats again on the house! can't wait to follow along. and i'm sorry you're nervous about your marathon but it sounds like you're going into it with the right frame of mind, as a learning experience, and i'm sure it will be fabulous. and i love rachel, she's the bomb! Congrats on closing on the house!!! That is so exciting! Following along with the new blog, I just love home stuff :) Good luck with your marathon! I am sure you will do just fine! Congratulations on the new home! And the new blog! I'm such a sucker for home posts. Thanks for hosting!! I just commented on your other blog, but again I'm just SO proud of you and all that you accomplish! Maybe it's a blessing that work is slower right now because you have the ability to focus on a lot of different and really good things. I love Rachel's blog and you look like a dime in that closing picture BTW. I love Rachel at a Nesting Nomad! I'd never be able to run two blogs. I wouldn't be able to keep up, plus since it's basically about my life, you get all of it. LOL. Really exciting, making your home "yours." Have fun with it! Congrats on the new house! The home tour was really so fun and I'm so happy for you guys that you found something you love (on a cul de sac to boot!) As for how to separate the content of your blogs, I am no help there but if you decide to officially switch makeup/fashion stuff over there let me know because I don't want to miss out! I'm so happy you liked it Gina :) I'll keep you updated! UGH. I swear I just commented? And now it's gone? Maybe I am crazy. Love the wood & blue logo & I hope you'll share a home tour for those of us that don't Snap! ah a new house! congrats! how exciting is that :) and also a big congrats on the new blog! that will surely be fun to follow along and read! Yesss, congrats on your house! That is so exciting! I hope you'll share pics. I dream of owning a house one day :). Seriously...so many emotions right now haha! Congrats on your new home! And on the new blog! I'm always impressed by people who can run more than one blog! CONGRATS on your new home!! That is sooooooooo awesome! I love that you closed on April 1 and I'm glad they weren't like "APRIL FOOLS YOU DON'T REALLY GET A HOUSE!" lol. I'm glad to hear you have a new strategy and goal race for the fall. I'm sure you will crush Towpath and that you will do even better than you think at your full this month. I mentioned last week that I made myself let go of my time goals for Pittsburgh, and I have felt so much happier that way. It's amazing how much pressure we can put on ourselves. Your heart was clearly in other places this Spring, and there will always be other races. Excited to follow your new blog! It's so funny because I was thinking that if I didn't have a blog I would have no worries about the race and would just enjoy it, but I feel like I'm letting everyone (haha about 10 people who actually read). So now I'm trying to change my focus back to my pre-blog days and just do it for me! I'm glad you can understand!! I bet you your practice race will turn out way better than you think it will. Life kinda works out that way sometimes. Congrats on the new house! SO exciting. And really cool about the new blog! I'll totally check it out! We'll see! Either way, I'll be happy. Going in with no expectations so I can only be happy at the end! Shoot, I wanted to do the linkup this month but forgot. :( So excited for all the good news from you. Congrats on your house & new blog! Yay! You finally got a house! Congratulations to you and Dan. I'm usually one of those bloggers that just comes for the running updates, but I have been seriously excited for you to get a new home and for all of the house related posts. I closed on my home over a year ago and have only just started working on buying furniture and decorating. Right now all I have is hand me down furniture and blank walls. I loved your holiday DIY projects so I knew you would have some awesome home ideas too. I'll definitely be adding your new blog to my reader. Congrats on the new house and blog!!! How exciting!! !My husband and I love DIY projects! Thanks Taylor! I'm sooo excited to get started. Congrats on the new house and new blog! You have so many good things going on in your life right now. Your approach to the race sounds smart - it's hard to balance busy life stuff with big goals and life should always come before running. And it will be such good practice for all of the tricky parts of marathon running to prepare you for a goal race! congrats on the new house! That's so exciting :) And a marathon!? good luck! So many congrats on closing on your house! Congratulations on the closing of your first house! I’ve always wanted to live n a cul-de-sac too, and I’m so glad it worked out for the two of you. I hope the moving process goes as smoothly as possible! Congratulations on closing on the house! those are always exciting times! Marathon is close!! I'm sorry, I can't remember, you have done a marathon before, right? You will do great! You have put in so much training, and so much work! I always say that the race is the victory lap for all the training! Now, let's hope for good weather! Thanks Ana! I've done two full marathons before. The past few weeks have been less than great, so I'm hoping that I did enough. We'll see soon enough! I wish I could have a travel blog as well! If I had a million dollars, I would just travel and talk about it all the time. Good luck with that! Congrats on closing on the house! Moving is always stressful, but I'm sure it's also a relief to be done with house hunting and bidding wars. I'll have to follow along with the new blog ... I love seeing how other people decorate (mostly because I'm too lazy to do that sort of thing myself haha). WOO! Yay for starting your new blog! :) can't wait to follow it! I'm loving it so far! Can't wait for you to see it! Congrats on the house! House hunting is so daunting & they always go SO fast. How exciting that you're in the neighborhood you wanted to be in too! Everything worked out in the end thankfully! Congrats on the house! How exciting! WOW! So many BIG things for you. New house, new blog, marathon. I'm over here all like "hooray, I got my nails done today!" Huge congratulations on the house! I'm so pleased you got a place that suits you so well. I am still renting so I live vicariously through those who can make their places pretty - so I will be following your new blog avidly! Lots of luck for your marathon, I continue to be impressed by anyone who runs so I'll be blown away whatever your result! And thank you so much for featuring me, I am blushing so hard over here. Such kind words! That's so exciting that y'all closed on your house! I know that I couldn't wait to start moving everything once closing was done! And I love Rachel! She always some of the best travel stories! It's been so fun to move everything over!